Hello good folks! We hope you had/are having a wonderful holiday. For those of you whose tradition involves a living tree – we welcome your tree donations! Goats are ruminant animals (they have 4 stomachs!) and evergreen trees are not only great for digestion, but offer other medicinal benefits! 1) Fir, Pine, Spruce… all “clean” (see below) evergreen trees are welcome. 2) Trees must be free from tinsel, ornaments, chemical treatment and spray paint. 3) We do not offer tree pick-up. 4) This is not a farm tour. We do offer farm tours at other times!! Please sign up for our newsletter at the time of your visit for updates on future farm events! 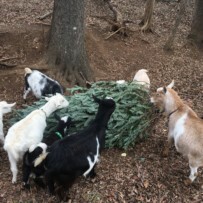 5) You may visit the goats at the time of your tree drop off. Do not enter the barn. Please be advised, fences are electric and are turned on. 6) To support the farm and purchase farm products, please visit our online store. You may pick-up pre-purchased items at your convenience, scheduled at the time of your purchase. We thank you for your support! 8) There are two gravel driveway entrances. Use either one. Please pull all the way forward to drop trees. Follow signs for drop off. 9) Thank you!!!! Look for photos of our goats enjoying your donations on our website and social media pages. Receive one entry for each tree donated into our Trees for Health raffle. In honor of our ruminant friends, we will draw four winners (one for each stomach!) though the end of January. Prizes will vary. Tree donations (and evergreen tree trimmings!) are welcome throughout the year.